The pros at Door Pros know how invaluable top-quality weather stripping can be. It protects your indoor space from the scorching heat in the summer and from the chilly cold in the winter. It can save you as much as 10 to 15 percent on your energy bills. Weather stripping also serves as another kind of a watchdog, protecting the interior of your home or business from dirt, sand and other grime from the outside world. And it can also be an effective noise buffer. 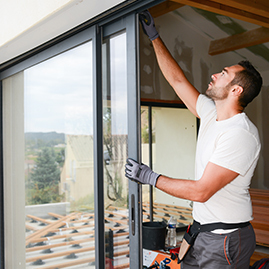 The experts at Door Pros can install, replace and repair weather stripping on all of your windows and doors. Plus, we offer preventive maintenance plans. When the weather stripping in your home or business needs additional backup, we’ll bring in the big guns (our caulking guns) to keep the outdoor elements from slipping through the cracks and invading your indoor environment. When you rely on us for weather stripping and caulking services, you will get the best in quality workmanship and superior materials. We’ll come knocking with our prompt service and top-notch expertise. At Door Pros, our techs are licensed, bonded and insured to offer you total peace of mind. We understand the weather stripping needs of every type of home from modern to vintage. We understand that frames can be uneven and gaps in doors and windows vary from property to property. We will customize our weather stripping strategy to best meet the unique challenges of your particular space. We treat every home and every customer with the courtesy, respect and TLC you deserve. We’ll scour your home from top to bottom to make sure it’s protected from the elements. And when we leave, you won’t be able to find a trace of evidence that we’ve been there—except for your heightened level of comfort, of course! V strip: The “V” shape of this weather stripping gives it its name. It comes in durable plastic or metal and the “V” springs open to bridge any gaps. V strip, which is also called tension seal, is commonly used along the sides of sliding or double-hung windows or along the top and sides of doors. Felt: This weather stripping is available either plain or with a reinforced pliable metal strip. It is most often used around door or window sashes and in door jambs to fill in the space between the jamb and the door. Foam tape: This versatile weather stripping is made from open or closed-cell foam or from rubber. It is made in various thicknesses and widths, making it a good choice for irregular-sized cracks. It is commonly used inside door frames and at the top and bottom of window sashes. Door sweeps: These are flat pieces of stainless steel, aluminum or plastic fitted with a strip of plastic, nylon or vinyl or a sponge brush to fill any space between a door and its threshold. It is used along the bottom of the interior side of a door. Tubular rubber, vinyl or silicone: These products serve as effective air barriers. The silicon version is typically inserted into milled grooves; the other types are attached to metal or wooden mounting strips. They are used along the tops or bottoms of window sashes, the base of doors and windows, between a door and door jamb and at the bottom of a door. Maybe your pet chewed or clawed away some of your weather stripping. Or perhaps your weather stripping is cracked or crumbling due to heat and high humidity. Or maybe it’s just the victim of normal wear and tear. 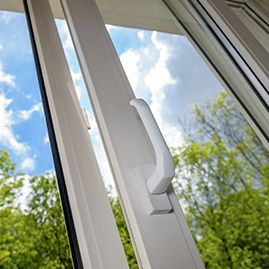 Whatever the problem, Door Pros can replace or repair your weather stripping so it’s safe, functional and effective. Trust the Experts to Do It Right! Installing or repairing your own weather stripping sounds easy, doesn’t it? But it can be more challenging than you think. A stubborn corner. A narrow ledge. An uneven space between the door and the door frame. An unusual track. Weather stripping set in a channel. Outdated weather stripping that’s hard to replace. 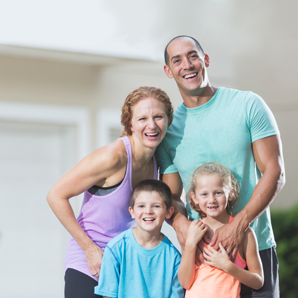 All of these challenges and more are no problem with the pros at Door Pros. We’ll come up with the solution that’s just right for you.